Has anyone tried using a hydraulic bicycle handbrake lever for the rear brake ? Will it work well enough? I have set off my bicycle just sitting around. Last edited by Rainerio; January 15th, 2019 at 01:36 AM. I rqan a LHRB off the magura m/c for about 6 racing seasons Rainerio? I had no clutch other than auto clutch, does that count? i entered a race meeting with the set up and belted into the first corner, got it right, then wrong at the next one and basically never made the mistake again - I just rode it like a Bicycle. I've used a couple different ones on different bikes. I ride mountain bikes a lot and the control with your hand on a steep downhill is way better than what I get with my boot. Most MTB brakes have a pretty small reservoir so look for larger ones. Rekluse adds a spacer to a Hayes radial mount type - a little bit cheesy but works and fits well. I made a spacer myself and used one and it works fine but it is not as robust as you would like to see on a dirt bike. I also used a higher end Formula brake lever and it was more robust & better than the Hayes. The best option I use now took the most work. I bought an older Hope Mono lever and cut off the bar mount and TIG welded on a mount from an old clutch perch to get the fit I needed for the Handlebar switch. It has a bigger reservoir with a removable cover and is a high quality piece. You can find them on ebay used for cheap and rebuild kits are still available. Not worth it though if you don't have a TIG. 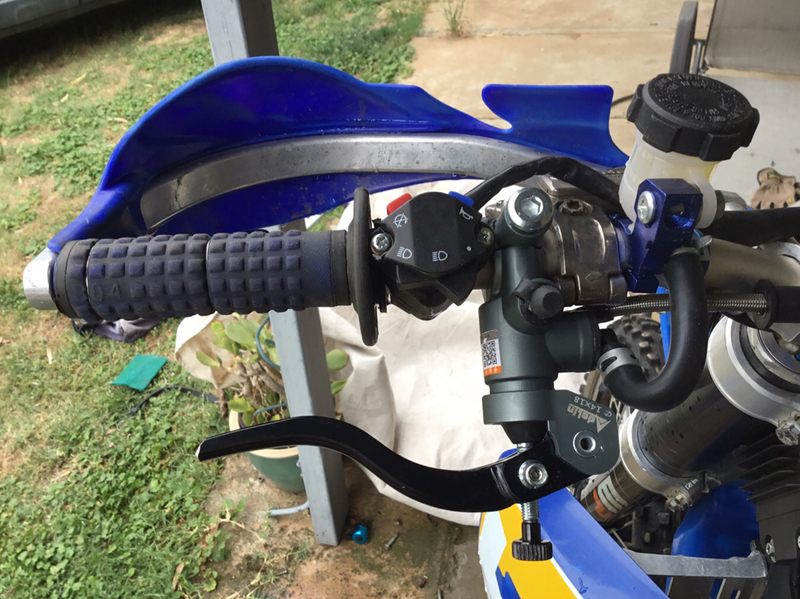 The size and shape of the handlebar switch for street legal bikes also has an impact on what you can fit and the resulting angles for the clutch lever and the rear brake lever. I usually put on a smaller one that has an off position for the headlight anyway. I have had the same idea Raineiro, I have a mtb brake master which I intend to try use as a lhrb. I belive it should work, as funmachines stated above, it is quite similar to what Rekluse uses for their lhrb. Very small reservoir, but shouldnt really be an issue, as long as you keep the brake fluid level topped up as the brake pads wear out. 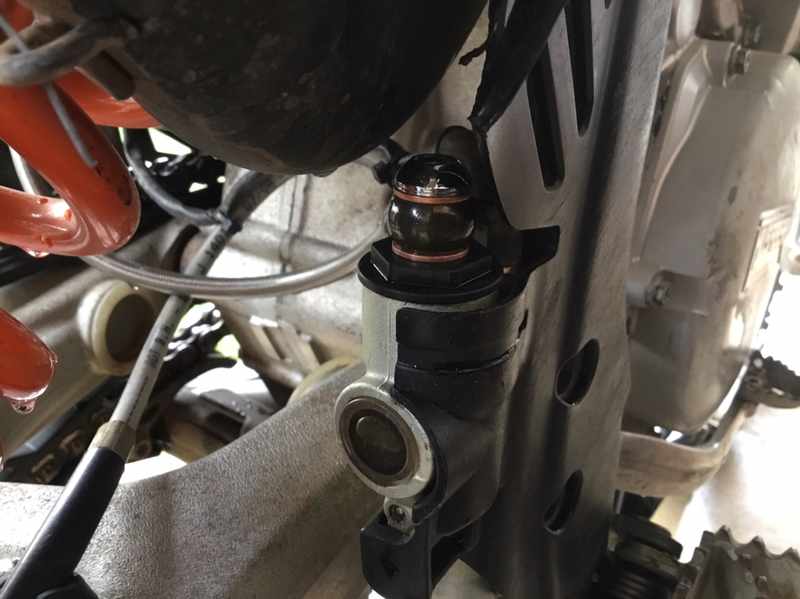 Just remember to open the reservoir cap (to bleed off exess brake fluid) before atempting to push back the piston when replacing brake pads. Last edited by Rainerio; January 18th, 2019 at 09:49 PM. Im currently playing with a home setup LHRB (really a thumb brake at this stage). The foot brake master adaptor is avail separately from Clake. I used a braided brake hose and radial master cyl from AliExpress. The piston dia is 14mm probably too large. Today ihave been researching the MTB levers. The likes of Smokn use the Hayes radial master. An adaptor to suit the larger braided lines needs to be purchased. I havent got this far as yet. Bleeding the system has been interesting. I had to remove the adaptor, fill the master, replace adaptor then i bleed a little from the rear caliper with the banjo bolt loosened. I then backed of the brake light switch and did the same. Then a bleed at the hand master. Both the lever and foot pedal feel hard but neither lock up the rear disc. Ill tie the hand lever in over night. Yeah Magura uses mineral oil. Last edited by Rainerio; January 18th, 2019 at 10:36 PM. Being cheap is good mate. Give the brain a little work out also. Im sussing out Hayes and Shimano lever assy’s. Finding it hard to find a lever assy without the caliper at this stage. While ive gotya, do you know what the ideal hand master piston size is? Clake use a 9.5mm. Do you know what these MTB masters are?